I am not affiliated in any way with Yelp. I do love Yelp and it’s a product that I use daily. I am here to explore some areas where I think Yelp could improve their User Experience. Identify the pain points in the ‘Yelping’ process: Searching for restaurants and writing a review. 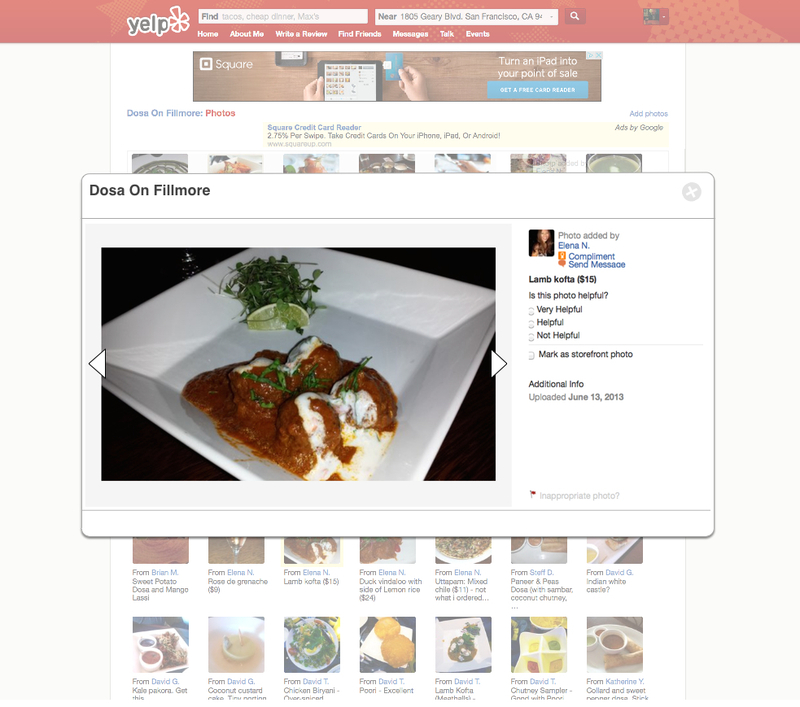 I tested Yelp’s web app with a total of five users. I sat down with each user at a cafe and asked them to perform a series of tasks. Open-ended questions were asked to encourage user insights. The users were grouped by colors, and their issues were presented on separate sticky notes. After organizing them by color, I proceeded to group the notes into similar issue ‘buckets’ to analyze the frequency of problems. Items in ‘buckets’ were then grouped into specific issues. Problem #1: Most users had difficulty navigating back to the search results after browsing through the photos. Every time they clicked to enlarge a photo, the app navigates to a new page. To return to the search results, the user’s only option was to click the back button on the browser numerous times.There isn’t a “Return to Search Results” link and if the user redid the search, the filters would reset. Some experienced users had personal hacks ie.opening restaurant pages in separate tabs from the search results page. One person gave up on clicking back and redid the search applying all filters again. Problem #2: Many users clicked to enlarge several photos as part of their decision making process. When the user clicked on a thumbnail to enlarge the photo, the site would automatically reposition to the top, causing the user to lose their position on the page. Open a lightbox window when the user clicks on a photo thumbnail. This allows the user to exit the lightbox after browsing through photos and return to the search results page with 2 clicks (once to return to restaurant page, 2nd to return to search results) on the browser’s back button. This solution also solves the problem of unwanted screen repositioning. Most users expressed that Yelp’s landing page looks too cluttered with words and complained about the lack of personalization on their “Recent Activity” feed. Users did not read anything from the “Recent Activity” section because it wasn’t relevant to them. Customize “Recent Activity” when logged in to show activity from Friends when arriving on page to create a more personalized experience. Design suggestion to make “Recent Activty” default to “Friends” upon arrival to page. Four of the five users who tested the product experienced difficulty finding the location to filter search results to a specific operating time because it was hidden under “More Features.” Instead, they skipped applying a filter and opted to look at the business hours after opening the restaurant page. Change from a static option of “Open now at 3:45 PM” to “Open at [input box for time]” but leave the current time in the input box. User Research is only the beginning of my design process. This Usability Study Test helped me understand user’s needs and goals. The next step is to create a prototype and test it with users to see if it fixes the issues. As a designer, I would partner with the product manager or developer to discuss how these changes can be built into the product. You can also view this post on Medium!